In three separate shallow bowls add your flour, egg and in last one mix together your breadcrumbs and parmesan. Dredge your chicken starting in the flour, then egg then into the bread crumbs. Heat your olive oil in pan on stove on medium high heat. Add your chicken breasts to pan and brown each side for about 2-3 minutes until golden. Add your chicken to a baking dish and bake in oven for about 35 minutes. Spread 1/2 cup marinara sauce on each of your chicken breasts and top with 1/2 cup cheese. Heat for another 5 minutes until melted. 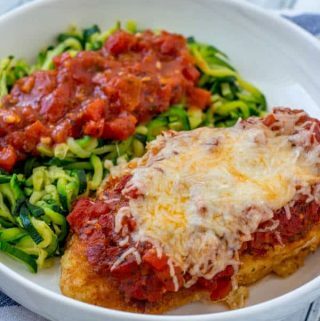 Serve over or alongside zucchini veggie spirals. Add more marinara sauce if desired.